Non-consumptive effects of predators can have important impacts on aquatic food webs, but there are few data on how predators change the behaviour of Caribbean reef fishes. Such changes may include behavioural responses to the invasive predatory lionfish (Pterois volitans/P. miles). This study used an aquarium experiment to examine the behaviour of herbivorous parrotfish (Scarus iseri) in the absence of other fish (control), with a non-piscivore present, and with a predatory threat from a native grouper or lionfish. Treatments were repeated with and without additional parrotfish shelters to examine the potential effects of degraded reefs (loss of refuges). Using video, parrotfish behaviours (sheltering, swimming in open areas, foraging, aggressive conspecific interactions, bite rates, and shoaling behaviour) were recorded for groups of four parrotfish. Compared to the control, the average number of parrotfish hiding was reduced by 65 % and foraging shoals were 10 % larger when threatened by grouper, likely as a specific response to an ambush predator. When exposed to lionfish, parrotfish reduced their bite rates by 50 %, possibly to be more vigilant of this predator’s unique stalking behaviour. The absence of additional shelter had limited effects although parrotfish formed 10 % larger shoals when swimming in open water, potentially as a defensive behaviour because of a perceived lack of refuges. The reduction in parrotfish bite rates caused by lionfish may have important demographic consequences. 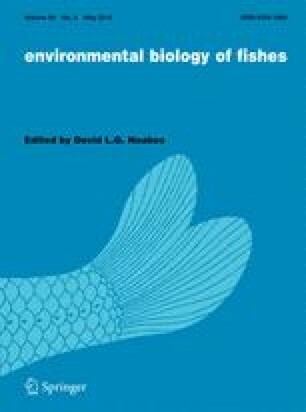 Furthermore, parrotfishes are important grazers of macroalgae, and these behavioural changes may exacerbate the direct effects of lionfish predation and potentially affect reef benthic dynamics. The online version of this article (doi: 10.1007/s10641-016-0486-9) contains supplementary material, which is available to authorized users. This project was funded by the Earthwatch Institute. ARH was supported by DECRA fellowship DE120102459 from the Australian Research Council. We thank the staff of the Cape Eleuthera Institute (CEI) and Earthwatch volunteers for assistance with the study, and S. Horn for help with video analyses. This study benefited from discussions with T. Kindinger. Work was conducted under a research permit from the Department of Marine Resources to CEI.